Did you know that there are four times more mobile phones in the world than there are PCs? Or that more people in the U.S. now own smart phones instead of more basic models? More and more, Americans are becoming addicted to their mobile phones. We take them with us everywhere! A recent study indicated that 91% of all U.S. citizens have their mobile device within reach 24 hours a day, 7 days a week. It's no wonder then why mobile marketing is so effective. Consider this... when a text message is sent to a user's phone, it gets read — typically within 90 seconds. No other form of advertising commands that level of attention from its target audience. But it's a lot more than just serving ads! 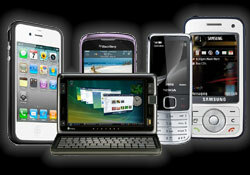 People are using their mobile phones for everything these days, including searching for products and services. If fact, one half of all local searches are now performed on mobile devices. If your Website is not mobile-friendly, you're missing out on an ever-growing market segment. Whether you're trying to attract new customers to your business or reach out to your exisiting customer base, mobile marketing can bring results. Call us today at 623-748-0360 to learn more about how mobile marketing can work for your business!